January 7 - Amtrak train number 351 between Kalamazoo, Michigan, and Porter, Indiana, and eventually on to Chicago, becomes the first Amtrak train to regularly travel at 90 mph in regular service. 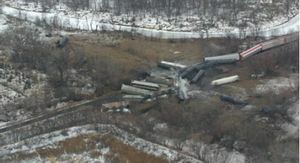 Aerial view of the CP derailment, January 18. January 18 - An eastbound Canadian Pacific Railway train encounters a broken rail in Minot, North Dakota, and derails. Five tank cars carrying anhydrous ammonia are ruptured and spill 146,700 gallons of the chemical; the vapor plume kills one resident, injures about 350 other people and affects about 11,600 as emergency crews advise residents to shelter-in-place. Construction begins to extend Korea's Gyeongbu Line from Daegu to Busan. 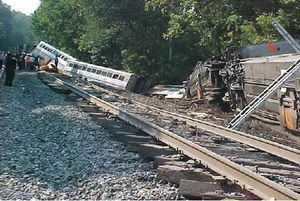 July 29 - Amtrak's eastbound Capitol Limited encounters a track misalignment in Kensington, Maryland, just northwest of Washington, D.C., and derails 11 of its 13 cars; 95 people are injured in the accident, 16 of them seriously. October 21 - The engineer of a westbound Union Pacific Railroad train leaving Proviso Yard in Chicago falls asleep at the controls, causing his train to collide with a BNSF Railway freight train negotiating a crossover at Norma Interlocking in Des Plaines, Illinois; the crew of the UP train receive minor injuries in the accident. ↑ Railroad History Timeline - 2000's. RRHX: Michigan's Internet Railroad History Museum. Retrieved on 2008-01-06. ↑ Railroad Accident Report: Derailment of Canadian Pacific Railway Freight Train 292-16 and Subsequent Release of Anhydrous Ammonia Near Minot, North Dakota, January 18, 2002. United States National Transportation Safety Board. Retrieved on 2008-01-18. ↑ Railroad Accident Brief: Derailment of Amtrak Train No. 30, The Capitol Limited, on CSX Transportation’s Metropolitan Subdivision in Kensington, Maryland, July 29, 2002.. United States National Transportation Safety Board (2004-05-28). Retrieved on 2008-01-18. ↑ Railroad Accident Brief: Collision and Derailment of Union Pacific Freight Trains MPRSS-21 and AJAPRB-21 at Des Plaines, Illinois, October 21, 2002. United States National Transportation Safety Board (2004-05-27). Retrieved on 2008-01-18. This page was last edited on 30 January 2012, at 19:49.